Our recent articles regarding the a new patent from Intellectual Ventures that attempts to assert ownership of DRM for 3DPrinting raises a plethora of validation issues, concerns, positive applications and negative speculations. It’s perhaps an obvious approach, which most engineers or designers could, and doubntless have, conceived. Leaving aside this familiar problem with the patent system, there’s an important expostulation that does not arise in the above exposition – that the printer has the power to disregard the users instructions: to refuse to print the object that you wish, because of the DRM in the file describing it, or there is no DRM at all. This parallels the situation for computers, where DRM is based on the assumption that your computer is not fully under your control, and has the ability to ignore your commands. That’s one of the reasons why free software is so important: it is predicated on the idea that the user is always in control. That is, in making the award, the FSF has established that the LulzBot remains fully under the user’s control. Until now, that hasn’t been an issue – there’s no practical way to stop someone from simply downloading a file and then printing it out on a compatible 3DPrinter. But the patent from Intellectual Ventures is the first step towards a time when users of 3DPrinters will be confronted with issues of control in exactly the same way that computer users are today. Once 3DPrinting becomes more widespread, we can certainly expect pressure from manufacturers to bring in laws against unauthorized copying of physical objects and circumvention of 3D DRM schemes, just as the copyright industries have pushed for ever-harsher laws against file sharing. They may even try to get open hardware systems like the LulzBot made illegal on the grounds that the user is fully in control – just as large multi-media companies would doubtless love to make computers running free software illegal? That’s a battle they lost, largely because free software existed long before digital media files were sold to consumers. ‘One of the greatest benefits of 3DPrinting technology – the ability to make replacements or parts for household objects like toys, utensils and gadgets – may be denied to US citizens thanks to the granting of a sweeping patent that prevents the printing of unauthorised 3D designs. It has all the makings of the much-maligned digital rights management (DRM) system that prevented copying of Apple iTunes tracks – until it was abandoned as a no-hoper in 2009. US patent 8286236, granted on 9 October to Intellectual Ventures of Bellevue, Washington, lends a 3D printer the ability to assess whether a computer design file it’s reading has an authorisation code appended that grants access for printing. If it does not, the machine simply refuses to print – whether it’s a solid object, a textile or even food that’s being printed. The piracy of 3D designs is indeed an emerging concern, and 3D object sharing – rather than file sharing – sites have already sprung up. While no 3DPrinter maker has adopted what might be called “3D DRM”, international treaties like the Anti-Counterfeiting Trade Agreement mean it is not out of the question. The firm, run by Microsoft CTO Nathan Myhrvold, quietly files patents under the names of a great many shell companies (as this Stanford University analysis shows) and then licenses them to companies using the ideas it lays claim to, litigating if it has to. Intellectual Ventures is thought to hold more than 40,000 patents. The new patent may face challenges to its validity, however, because it extends rights management beyond 3DPrinting to much older computerised manufacturing techniques, such as computer-controlled milling, extrusion, die casting and stamping. Most 3DPrinting has been done in industry or by hobbyists who share their designs freely online. Now Intellectual Ventures, the company run by former Microsoft CTO Nathan Myhrvold, has been issued a patent on a system that could prevent people from printing objects using designs they haven’t paid for. The patent basically covers the idea of digital rights management, or DRM, for 3DPrinters. Like with eBooks that won’t open unless you pay Barnes & Noble to use its Nook Reader, with Myhrvold’s technology your 3DPrinter won’t print unless you’ve paid up. Myhrvold’s timing of the 3DPrinting revolution could be perfect. The company MakerBot just opened the first retail store dedicated to 3DPrinters in Manhattan’s trendy SoHo neighbourhood. The second by company DeezerMaker opened within days afterwards in California. Industries that would almost certainly be put out of business by 3DPrinting, were it to become a household norm, are not going to go down without a fight, say legal experts. And what will be their weapon of choice? The presumed fear is that people will eventually be able to download CAD files, or create their own with advanced 3DScanners, of anything in the world: shoes, televisions, guitars, iPhones, and on, and on. Yes, 3DPrinter users would likely have to create these object piece-by-piece (as is currently the case). But in the end, they would still have a complete product. So just as the movie and music industries have gone after bit-torrent files and the sites that share them in their war against online piracy, so too will manufacturers attack CAD files and CAD file sharing, experts watching the space believe. While patent and trademark law may be used by established industries to trample 3DPrinting, both have a number of limitations that will make them difficult to use against home 3DPrinting, explains Weinberg. Instead, threatened industries will likely seek to strengthen copyright laws to make the recreation of objects — or even the creation of objects that perform the same function as a copyrighted item — illegal. As mentioned, the goal of Weinberg’s paper is to prepare the 3DPrinting industry and its customers for a coming legal battle over this emerging technology. For the moment, however, 3DPrinting remains a niche. Maker Faire 2012 in New York last weekend was a great place to see, first hand, the products and processes behind a very promising technology that’s been receiving so much attention lately, and rightfully so. It’s clear to many that 3DPrinting isn’t merely a passing fad, but perhaps an evolutionary step in the field of manufacturing, if not revolutionary, and that has some people very nervous. 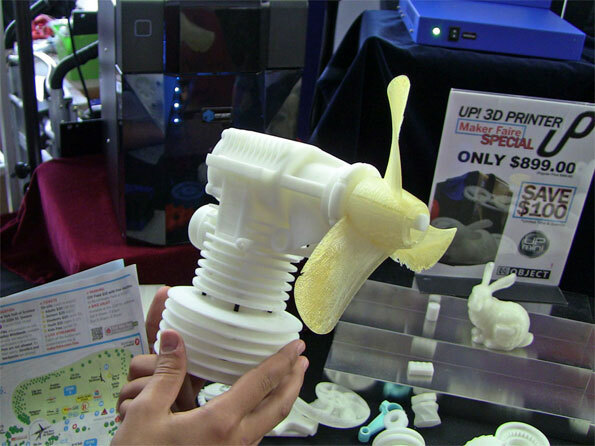 3DPrinting has the potential to shake up the consumer landscape as we know it. Not today, not tomorrow, but down the line, home printing machines like those of RepRap, and Makerbot, are only going to get more advanced and accessible. There will come a time when home users will be able to print everyday objects from home. That’s an awesome thing, and perhaps scary to some. 3DPrinting has now captured headlines for just being itself – what it can do now, what it will do in the future – but just as many headlines are now being captured by 3DPrinting’s recent darker application’s, such as the hobbiest project to create a home 3DPrintable gun by Defense Distributed. Politics being what they are, you have to wonder if 3DPrinting will ultimately fulfill its potential of shaking up the industry and revolutionizing big industry, or if big industry, along with the government, will weigh the technology down with rules, regulations, and a ton of red tape. As CreativityGames.net points out, it’s only a matter of time before the lobbying for laws and restrictions begins. In a now ongoing saga Defense Distributed, a group of pro-gun lobbyists with the idea to 3DPrint a live firearm, has had its 3DPrinter seized by the machine’s manufacturer Stratasys. Whilst some students may be intrigued by innovative cutlery design, and schoolboy bravado regarding an interest in weapons/ fast cars/ protein suppliments, we will inevitably face the forthcoming legislative backlash regarding the concern that if anyone can download a file to manufacture a weapon, and the technology continues to progress, ‘press to print products’ will degrade into a home 3DPrinting black market. How to stop 3DPrinted home weaponary proliferation? Restricting C.A.D. files of weapons from appearing online seems to obvious and popular suggestion – although this simply leads to the difficultly in policing the internet. Who would have thought it? Printing guns is frowned upon. Even in the U.S.
Cody Wilson, a law student at the University of Texas at Austin, found this out last week when Stratasys, the company that made the uPrint SE 3DPrinter he was leasing, got wind of his plans to design a 3DPrintable handgun and took back their equipment. “The company is less than thrilled with what we’re doing. They’re trying to prevent me from breaking any laws with their product,” Wilson told New Scientist. As reported previously on the DIMENSIONEXT blog, Wilson and friends founded a group called Defense Distributed to promote ideas about universal gun ownership. Stratasys didn’t beleive that: Defense Distributed’s stated aims include the building of two prototypes of differing complexity that can be printed on a uPrint SE. If the guns work, the group will modify the designs for use on entry-level 3DPrinters like those of the RepRap Project. The plans are limited to C.A.D. files, no physical prototype exists, but if Wilson and company manage to build the first fully printable gun, they will risk more than just running afoul of the law. Bullet propellants can create temperatures of up to 1000 °C. The powdered nylon that entry-level 3DPrinters use for construction, called ABS, cannot cope with that. “The gunpowder explosion will probably be too much for ABS and other plastics in low-end printers,” says Stuart Offer of 3DPrinting firm 3T RPD in Newbury, UK. In all likelihood the gun would be destroyed, perhaps even blowing up in the shooter’s hands, after firing no more than a few rounds. 3D printers exist that fuse metal powders using laser or electron beams to produce sturdy, solid objects. But those machines cost around £500,000, says Offer, who uses them to make driver roll hoops for Formula 1 cars. And assembling a gun isn’t like snapping together Lego pieces – each part must fit and move precisely. Could they lean on internet service providers to seek out and delete gun design files as they circulate online, as some ISPs are now asked to police music and movie file-sharing?